As part of a recent green campaign against Steve Milloy’s new book Green Hell — click here for the Earth First! 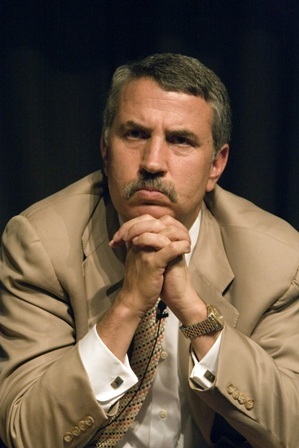 smear — the green BuildIntelBlog put up a virtual debate between Milloy and New York Times columnist Tom Friedman, author of the book Hot, Flat and Crowded. Milloy actually had this sort of idea first and, in a May 11 e-mail, suggested to Friedman a real live debate of the themes of their books. Alas, Friedman has not responded. Perhaps Friedman’s enthusiastic agreement to the challenge was lost somewhere in electronic oblivion or, perhaps, like Al Gore and other alarmists, he’s simply aFraidman. So which is it, Mr. Friedman? Hmmm... could I really defend 'Hot, Flat & Crowded'? This entry was posted on	June 16, 2009 at 8:03 pm	and is filed under Announcements and News. Typical liberal behavior. That’s why they want to shut down conservative talk radio and FOX news, and why they threatened to revoke the liscense of any meteorologist who spoke out against global warming. They don’t want opposing views to be heard (on any topic). (1) Liberals are free to have radio shows of their own, and they have tried. They fail miserably except for a rare few, and none compare to the success of Limbaugh, Hannity and others. If you can’t beat ’em, shut ’em down. (2) FOX news is not an all conservative news channel, despite what the left and the mainstream media claim. They have reporters and personalities from the left, also. The big difference is that they also have pundits, so they can inject their opinions on BOTH side of the issues. That’s why they have higher ratings than several competing channels combined. You hear a lot wider range of opinions and have a much higher chance of hearing ignored news on the mainstream channels. The mainstream media may not speak directly as to their opinions, but it is very obvious in the tilt of their coverage and what info they leave out. That’s why more and more people are turning to FOX. This is virtually the only channel where conservatives have a voice. If you can’t beat ’em, shut ’em down. (3) There have been over 30,000 scientists dispute the so-called consensus, but the leftists and the mainstream media ignore them. They dont exist. For the ones that dare to speak out, they are in danger of losing their funding. As for the meteorologists, they have been threatened with losing their liscenses. If you can’t hush ’em, remove something they rely on so they will shut up. Down with the fascist left. What I meant was that you have a much higher chance of hearing news that’s being ignored on the mainstream channels. A virtual debate of virtual climate change. We may be onto something here. It won’t happen. They claim they won’t debate because it’s a settled argument and there’s nothing to debate. That’s an obvious lie when there are tens of thousands of scientists diputing it and there has NEVER been a debate. How can an argument be settled when one side has claimed outight victory and they never even showed up for game (so to speak)? I’m sick of this. If the left actually believed in their science, they would show up to the debates being asked of them. But they know they will lose, so both they and the media ignore opposition. Like most of the Green Weenies…they flog you about the head and shoulders then run and hide. God forbid they stay and discuss the issues like real scientists. They attack the speaker then consider the argument won. I see it every day trying to discuss AGW, national defense and the like with my liberal friends.